When it comes to long-term savings vehicles, Americans are quite fond of real estate. Just look at the new study from Gallup which found that a 35 percent plurality of surveyed U.S. adults consider real estate to be the best long-term investment. That is a large increase from the prior year’s survey and puts real estate well-above the favorability readings for stocks (22 percent), gold (17 percent), savings/CDs (15 percent), and bonds (7 percent). Some of this positive sentiment is likely related to home values appreciating significantly in recent years, with growth that has easily outpaced headline consumer inflation. However, there are also fundamentals that support the case for real estate being a solid investment over the next few decades. For example, Millennials, the largest cohort of the U.S. population, are getting older and many will therefore start to get married and have children. This should lead to a higher rate of household formation as a lot of Gen Y couples are forced to move out of their small apartments and into larger homes that can better support a growing family. Moreover, the resulting uptick in demand for housing should be supportive of higher home values in the long run, especially if supply struggles to keep pace. The assumption, though, that owning a home will always be a less risky investment than stocks, bonds, and other less tangible assets can be hazardous for one’s financial health. This is something that many Americans learned the hard way after the housing market tanked and the “home values only go up” adage was proven wrong. Indeed, many older individuals were especially hurt by the housing market collapse and had to postpone retirement because their homes had suddenly become extremely illiquid assets that lost a significant amount of value. 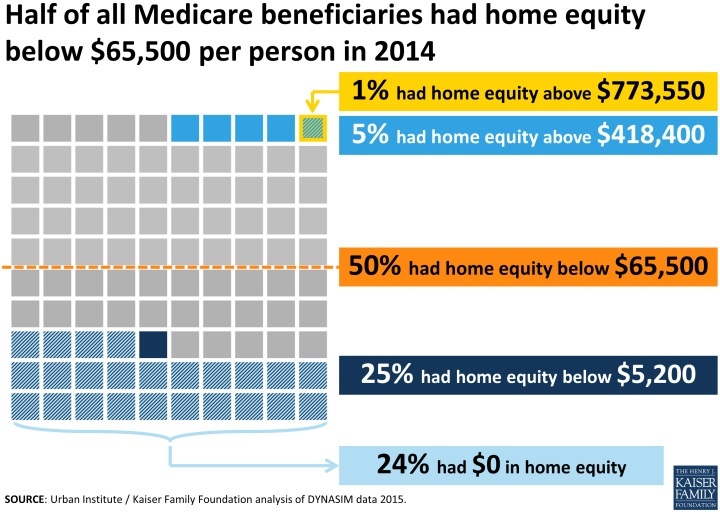 Further, retirees without any additional savings could be forced to respond to rising medical costs and other large, unexpected expenses by borrowing against the value of their home. What is worse is that this may not even be an option for many seniors because a recent study from the Kaiser Family Foundation found that an alarming number of older Americans have very little home equity (see above). Such findings, though, do not mean that people should avoid using real estate as a long-term investment vehicle. Instead, savers must use every tool at their disposal (real estate, 401(k)s, IRAs, etc.) in order to essentially diversify their retirement assets in the same way that a portfolio of stocks should be diversified. Doing this can lessen the sensitivity to the value of any particular retirement asset and therefore help ensure financial security in old age.